In its latest budget proposal to Congress, the Obama administration has requested $526.6 billion in baseline funding for the Department of Defense, a $1 billion increase from the administration’s defense budget request last year. 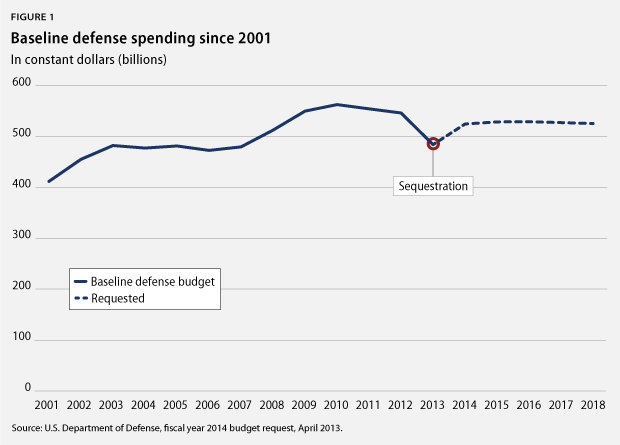 In accordance with the long-term budget plan it announced last year, the Obama administration’s FY 2014 defense budget request holds the baseline defense budget steady at historic highs after a decade of tremendous growth. This is a missed opportunity to realign our national security priorities. Unnecessary defense spending does not make us safer; it diverts resources away from other critical investments here at home that create jobs and rebuild our infrastructure. Moreover, many of the big-ticket items in the Pentagon’s budget request are ill suited for dealing with the complex transnational threats facing the country today, serve only to reinforce the United States’ overwhelming superiority in conventional and nuclear weaponry, and come at a considerable cost to American taxpayers. If Congress and the administration are serious about deficit reduction and serious about cracking down on wasteful federal spending, they should both aim to return the baseline defense budget to pre-9/11 levels as soon as possible. In unveiling its FY 2013 budget request last year, the administration announced its plans to reduce baseline defense spending by $487 billion over the next decade, as mandated by the Budget Control Act. These proposed “cuts,” however, came from projected increases in defense spending; the administration’s plan would have actually held the defense budget steady over the next 10 years in inflation-adjusted dollars. With its FY 2013 budget proposal, the Obama administration ended the irresponsible increases in baseline military spending that have occurred since 9/11, but its long-term budget plan did nothing to reverse this growth or bring the budget down from near historic highs. 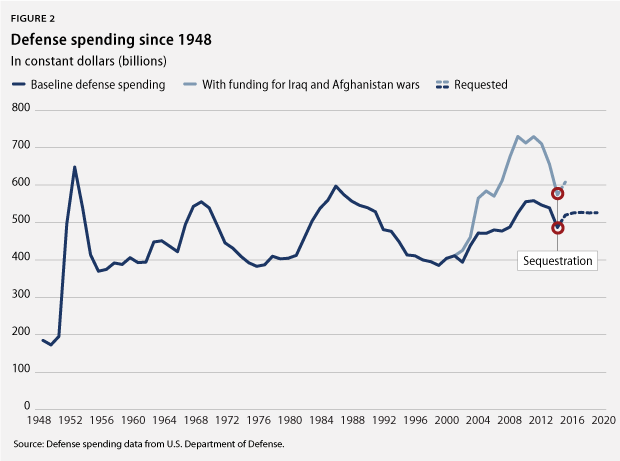 And unfortunately, the proposed FY 2014 budget maintains this unwillingness to return military spending to prewar levels or historical norms in real terms. Simply put, the United States can—and should—safely reduce military spending by more and can do so more quickly than the administration’s current plan envisions. Despite the national concern about the size of the federal deficit, the Pentagon’s budget has remained relatively stable in real terms in recent years, as shown in Figure 1. In fact, the only noteworthy reduction in defense spending since 9/11 occurred this year, in FY 2013, when sequestration required a $41 billion cut. In its latest budget proposal, the administration outlines a deficit-reduction plan, including both new revenues and spending cuts, which can replace sequestration and its across-the-board cuts. 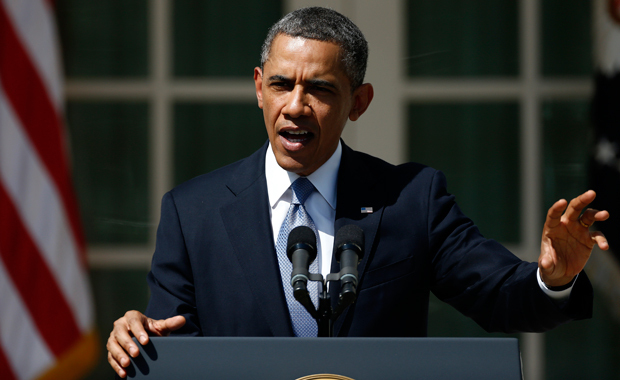 This plan includes about $100 billion in cuts to the defense budget beginning in 2017. Sequestration, with its across-the-board cuts, is not a smart way to reduce defense spending, and the administration’s desire to replace these automatic cuts with a more targeted deficit-reduction plan is understandable. By cutting all programs evenly, sequestration denies Pentagon officials the ability to manage the budget drawdown by targeting underperforming programs while protecting initiatives that have proven effective. Yet if the administration is truly serious about deficit reduction and cracking down on wasteful federal spending, the Pentagon can afford to cut more than $100 billion, and these cuts should begin before 2019. In fact, as shown in Figure 2, U.S. military spending reached unprecedented peaks during the wars in Iraq and Afghanistan. As the United States winds down its involvement in Afghanistan, it can return the budget to peacetime levels, which will require reductions of nearly $100 billion per year, not $100 billion per decade. Over the past four years, the Obama administration has demonstrated that it is serious about protecting the United States and its interests abroad. But the country needs a defense budget that’s effective, not just enormous. In 2011 we spent more than China, Russia, the United Kingdom, France, Japan, India, Saudi Arabia, Germany, Brazil, Italy, South Korea, Australia, and Canada combined on our military. Eliminate the Navy’s purchase of the troubled over-budget F-35C jet and instead purchase the effective and affordable F/A-18E/F jet. Savings: about $17 billion over 10 years. Reduce the size of our ground forces to their prewar levels. Savings: about $16 billion over the next decade. Reform the Pentagon’s outdated health care programs. Savings: roughly $40 billion over 10 years. Reduce the number of deployed nuclear weapons to 1,100 by 2022 from about 1,700 today. Savings: more than $28 billion over 10 years. Further, Congress must also accept many of the administration’s common-sense cost-savings proposals, including modest changes to health care benefits for military retirees, the creation of a new Base Closure and Realignment Commission to close down unneeded military installations, and targeted reductions or slowing down the procurement of over-budget or ineffective weapons systems. Lawrence J. Korb is a Senior Fellow at the Center for American Progress. Alex Rothman and Max Hoffman are Research Associates at the Center.